I am not the member of detecting Team of RBI. But as a true Indian, I always think that fake notes must be banned at any cost. In old days, I listened the small saying, "To sacrifice any bad habit is better than taking medicine after mis-happening due to bad habit." It means, if we start to aware to public to detect fake note, we can stop the mis-use of fake notes. 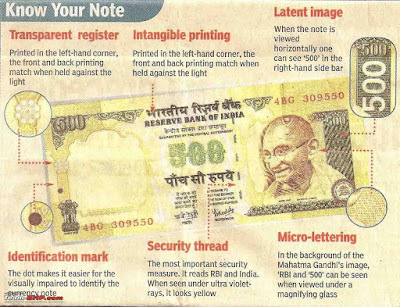 We just follow the RBI's given tips for identify the fake currency which are following. 1. Before accepting the Note, you must see Mahatma Gandhi's watermark picture. Just take the note in the light, you will see the portrait of mahatma Gandhi in the form of watermark. 2. Today cheaters are very smart, they can easily show the Mahatma Gandhi's watermark. Now, it is the time to become smart than cheater. Because if you have got the fake note, it means, its value is zero. It is also national loss. Because you have earned money with hard work and cheater has gained just exchanging it with your original note. Change the direction of your note vertically. See the green line. This is security line. On these line, there would be written "RBI, Bharat in hindi. 3. Now carry your note in the horizontal form. See the notes in number form. If it is the note of Rs. 100, you will see 100 near the picture of mahatma Gandhi. 4. The color of the numeral in the center (‘500’ in Rs. 500 note and ‘1000’ in Rs. 1000 note) appears green when the note is held flat but changes to blue when it is held at an angle. 5. Touch your hand to the note. Feel what is its sound. Compare it with past sound with original note. If both is differ, it means, this note may be fake. No Comment to " How to Detect Fake Notes "